First sightings of the Antarctic Peninsula are moving, surreal and unforgettable, especially on the 200th anniversary year of an expedition led by Nathaniel Palmer, the young sealer who, on November 18, 1820, became the first American explorer to discover mainland Antarctica. Share in the excitement of this historic moment as the Antarctic's offshore islands appear on the horizon. Your lecture program becomes especially poignant with an inspired team of A&K experts and guest lecturers shedding light on Palmer's voyages and the significance of his discovery. It sets the stage for inspiring daily landings along the Peninsula, all of which are carefully designed by your Captain and Expedition Team. Excursions via Zodiacs (sturdy inflatable boats) are also piloted by expert naturalist guides, joined by groups of no more than 10 guests and often accompanied by your lecturers. The year 1820 was significant not only for Palmer but also for Russian explorer Admiral Fabian Gottlieb von Bellingshausen and the British Royal Navy's Captain Edward Bransfield, who also made claims regarding the discovery of Antarctica. This special-edition voyage focuses on key historical areas at the center of these expeditions. Your Captain and Expedition Team carefully plan your active, curated itinerary, which is dependent on weather, sea, ice and wildlife conditions. With that in mind, daily excursions may include exploration of the following areas: South Shetland Islands: Remarkable history, amazing geological features and abundant wildlife define these islands offshore of the Antarctic Peninsula. Island visits may include Livingston, Half-Moon and Deception, where you may cruise into this flooded caldera to explore geothermal black sand beaches and abandoned whaling stations. You may also visit Anvers Island and Palmer Station, where you enjoy an exciting, behind-the-scenes look at the science happening there now. Danco Coast: Bordering the South Shetland Islands along the Antarctic continent, the Danco Coast is famed for its scenic, jaw-dropping waterways. 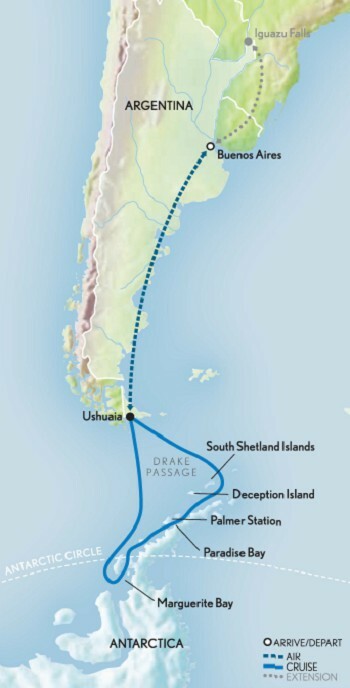 From the comfort of 'Le Lyrial,' you may sail through the Gerlache Strait, Paradise Bay and photogenic Lemaire Channel. Landings may include Neko Harbour, Cuverville Island and Wilhelmina Bay. Antarctic Circle: Conditions permitting, you may cruise beyond the Antarctic Circle at 66°34'S 65°44'W, along the west coast of the Antarctic Peninsula. You may also sail to the protected waters of mountainous Marguerite Bay; handwritten journals suggest that Palmer reached this far southern region on later expeditions. Landings may occur on Adelaide Island, which was discovered by British Explorer John Biscoe. You may also visit the British Antarctic Survey (BAS) station at Rothera. After mornings discovering the White Continent's rare and remarkable treasures from the shore to terra firma, return to 'Le Lyrial' for lunch. Enjoy time to relax and observe the surrounding abundance of wildlife, searching for everything from humpback whales and porpoising penguins to Antarctic and imperial shags. By afternoon, set out for the day's second excursion, which may include hiking on spectacular beaches teeming with braying gentoo penguins, or circumnavigating colossal icebergs that serve as floating homes to seals. After days of adventure, look forward to comfortable evenings aboard your luxury cruiser, sipping cocktails in the Panoramic Lounge before your choice of a buffet or elegant dinner. At night, recap the day's discoveries with your Expedition Team, enjoy entertainment in the theater, and chat with fellow guests in one of 'Le Lyrial's' lounges, ever on the lookout for late-night wildlife appearances just off deck. This cruise includes regular Zodiac boat excursions, walks over uneven terrain and optional, challenging hikes. Due to the nature of expedition cruising, this itinerary is subject to change and is for guidance purpose only. This 8-day itinerary combining history and archaeology will take you from Jordan to Greece. During your cruise, Le Lyrial will visit several unmissable sites between the Red Sea and the ......click here to read more. Embark on an award-winning Luxury Expedition Cruise for the centerpiece of the Southern Hemisphere — extraordinary Antarctica, where towering icebergs, massive glaciers and abundant wildlife make for the ultimate adventure ......click here to read more.